Pammy Blogs Beauty: FLORA + BAST's CBD Formula Products now available at Sephora! Have you jumped on the CBD bandwagon? Since the loosening of cannabis regulations, CBD is much more readily available to consumers throughout the country. That means there is a huge surge of CBD products coming out! I, for one, am thrilled by the CBD upward trend as I think that cannabis is an untapped resource for healing and overall health. CBD is also popping up in skincare. No surprise here! CBD is a powerhouse ingredient and it can do so much for your skin (from the inside out!). 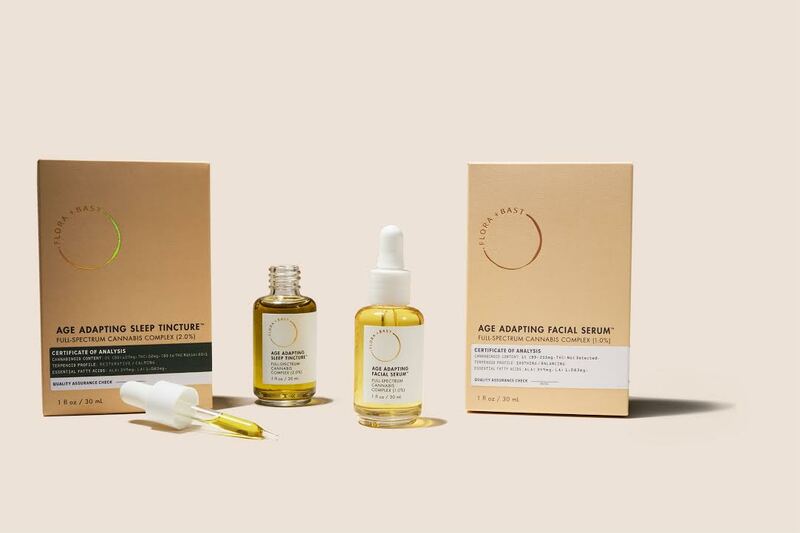 So, when Flora + Bast reached out to see if I wanted to try their Age Adapting Facial Serum and their Age Adapting Sleep Tincture, I jumped at the chance! Not only are their products made with Full-Spectrum Cannabis Complex (this is a must with CBD remedies! ), but also a percent of their proceeds goes back to support cannabis farmers. These are products that I can feel good about using! CBD (also known as cannabidiol) oil is the non-psychotropic component of marijuana. Note that CBD will not get you "high". CBD oil does not have the mind-altering properties of marijuana’s tetrahydrocannabinol (THC). CBD and THC are sourced from two different parts of the marijuana plant. CBD has gained a lot of popularity lately in the world of skincare. Not only is it known for relieving aches and pains when applied topically, but also it is promising in skincare products for its benefits. It has some reports that it works for everything from acne to wrinkles. So, naturally, I am curious! At FLORA + BAST, the philosophy is simple: procure the best ingredients, process them minimally, and preserve them naturally. Their formulas are organic, food-grade, and contain only three ingredients. They exclude water, emulsifiers, surfactants and preservatives that can cause harm to human health, leaving only what is necessary. This also means that the products are very concentrated and effective. So, you are getting the most out of each product and only need a small amount of product for results. Oh sleep, why are you so elusive? lol! I fully admit that I chronically struggle with insomnia. It is not always bad. However, about 1-3 nights per week every few weeks, I have trouble falling asleep and staying asleep. Also, I wake up periodically during the night. Part of this is related to having an autoimmune disease (I have Undifferentiated Connective Tissue Disease with Fibromyalgia) as there is a sleep component related to "pain" waking me up from sleep. However, my disease is extremely well managed and I have very few, if any, symptoms. So, the sleep issues that keep me up lately? My over-active mind and general stress. I know that if I take good care of myself and manage stress and exercise and use good habits (limiting screentime before bed), then I benefit with good sleep. However, sometimes life just gets in the way, right? So, I like to have sleep remedies on hand. In the past, when my autoimmune disease was giving me symptoms, I relied on prescription sleep meds. However, now I do not take any medications. If I have trouble falling asleep, I use magnesium lotion (magnesium naturally relaxes your body and mind), diffuse essential oils (I especially like using a combo of Lavender and Cedarwood), and if I am desperate, I take a low dose Melatonin gummy which usually works for me within 20 minutes. However, sometimes my sleeplessness might require more help. That is where my CBD Sleep Tincture from Flora + Bast comes in. It is yet another natural remedy in my arsnal for sleep support! CBD for sleep. CBD is fantastic for sleep! Not only does it help with falling asleep and staying asleep because of its relaxing effect, but also it has anti-inflammatory properites that work to help reduce your body pain which also leads to better sleep. I, for one, am super excited about that fact because of the impact of my Fibromyalgia on my sleep quality. How does it work? Well, apparently our bodies have receptors which are part of the "endocannabinoid system" that are activated by the natural cannabinoids found in CBD. The idea is that CBD will relax the body and mind by helping to regulate the endocannabinoid system (ECS), which is responsible for helping the body maintain homeostasis. In some limited studies, CBD has been shown to reduce inflammation in the brain and nervous system, effectively reducing pain and making it easier to sleep. How did it work for me? I found that I was able to fall asleep faster and that it reduced waking up in the middle of the night. I do believe that it helps to relax my body and in-turn works to regluate my general aches and pains. My biggest tip is to start slowly and figure out what dosage works best for you. Consult your physician with any questions or to help you determine if this product is right for you for your needs. I think using CBD for sleep is a fantastic option! It is non-habit forming and you can adjust your dosage to minimize any possible side effects. I always use some sort of facial serum or oil in the evenings. It is just that perfect "last step" in my skincare routine. Typically I wash my face, apply a hyaluronic acid moisturizer and a moisturizer to damp skin, wait 30 mins, apply Retin-A, and then follow up with a serum or oil before bed. This Age-Adapting Facial Serum has been a fanatastic addition to my routine. I literally just apply a few drops to my skin and gently pat it in. It has minimized my dryness and given my skin an extra boost of moisture and glow. Flora + Bast products available on the Flora + Bast website and Sephora and Sephora.com (since 2/26/19).